Yay for more Kekkaishi! 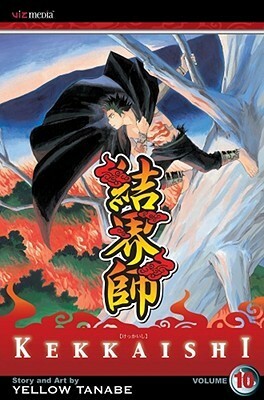 It has been nearly two years since I read the 9th volume of Kekkaishi. Now I've moved (twice) and my library doesn't carry any copies of Kekkaishi nor can I find it at Barnes & Noble. So I was forced to...gasp...buy it. Volume 10 feels more like Volume 1 for me since it's been so long since I've read the series. I often felt like I was forming opinions about these characters for the first time. Thankfully and surprisingly I remembered most of what had happened in the prior nine volumes. The short synopsis at the beginning of the volume helped too. I continue to love Yoshimori. I like his fierceness, his talent, and his stubbornness. I like that he seems more like a boy still than a young man. It seems realistic for a kid his age (I think he's 12). Sometimes his "stubbornness" most closely resembles whining. In most contexts that would be irritating, but it brings Yoshimori to life. The plot is pretty standard. Really important demons come to the site Yoshimori, Tokine, and Gen guard. The kids have to fight them. Added to the excitement is the fact that minor demons attack Yoshimori's house and his grandpa has to fend them off. I love his feisty grandpa who looks frail but can fight with the best still. There was a big surprise at the end. I'm wondering if they'll reverse course in future volumes but maybe not. At any rate, I can't wait to read more. Have you ever thought of reviewing a manga series instead of an individual volume? I've thought of doing that in cases like this one where the volumes seems almost the same. My problem is finding the series and reading them at one time. It's takes a really long time to interlibrary loan mangas from the library. This is one I never quite got into, but it does sound action packed. Gals exactly who fixed good magnitude from the very best is important with lifetime usually are desirous to opt for the fake prada product intended for many people are aware that regardless of the product or service can be, provided it truly is Chanel, it truly is will likely be impressively hip and something they may work with intended for many, many years. One of many recommended product on the model is usually it is combination of corrective and as well safety a pair of glasses. Chanel a pair of glasses include fully overtaken this optical area currently being extremely favorite models by means of gals intended for pharmaceutical drug fake chanel. This brand's specs never ever forget to deliver end users this healthy category they should be heighten the entire model, regardless of the the presentation may very well be, no matter if fake hermes is usually an morning gala with Liverpool with the GREAT BRITAIN elite of any picture or maybe this Coachella Pageant with Colorado. What women of all ages in particular appreciate related to fake gucci together with upgraded lenses is usually the point that whether or not many people be into the promotions intended for eye protection, this builders will be able to merge breathtaking refined to obtain a wonderful style that could go through as a result of time period. Presently, extremely favorite products intended for examining specs would be the Chanel replica chanel of which trendy fresh custom made, vogue type in addition to TELLY style Lauren Conrad possesses.